Poronpolun polkaisu is an easygoing MTB event at Räyskälä in Loppi. A bit of gravel roads, lot's of easy to ride good trails, and some short technical bits. 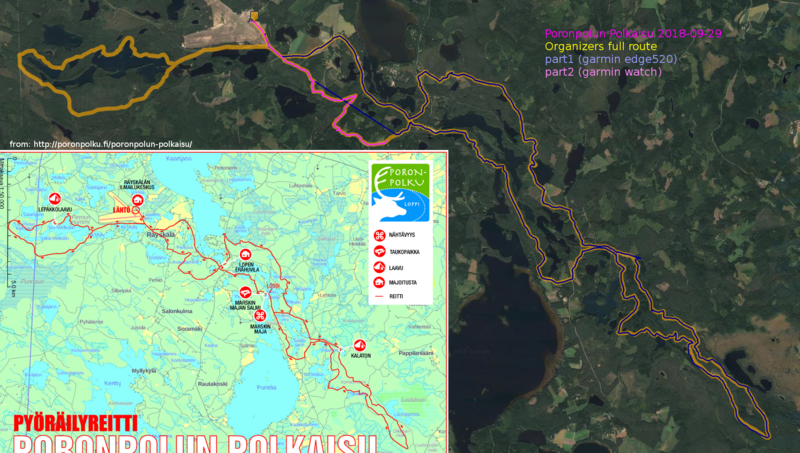 They say that the trails are some of the best for MTB in southern Finland! Time-lapse for garmin virb camera. Battery lasted about 2 hours. Go see more and better Poronpulku videos on youtube. Organizers map and GPX-route. We rode most of it but didn't have time (and energy?) for the westward loop. Garmin Edge 520 battery died about 3/4ths into the ride so the last bit is recorded with the 735xt instead.